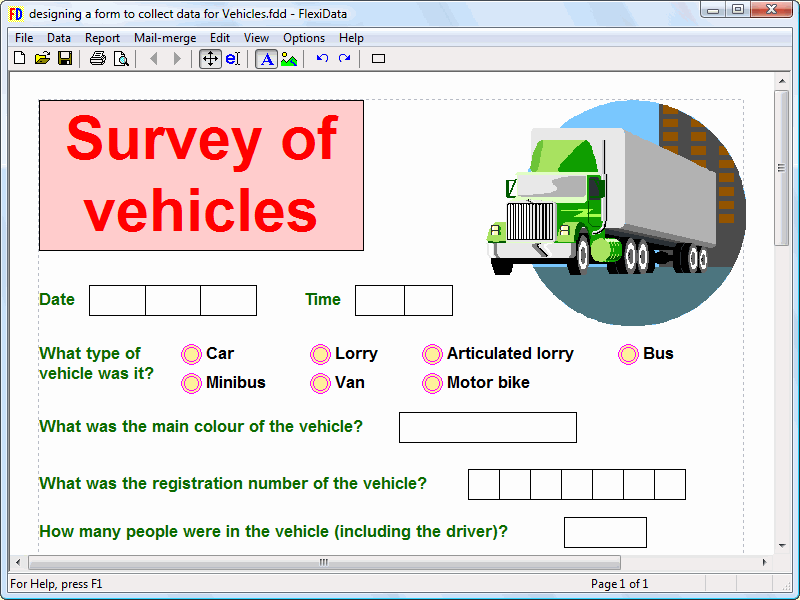 FlexiData is a data handling program which is designed for use in schools. It is able to deliver all of the collecting and analysing data that is required for KS3 and KS4 Computing courses. It is also suitable for other subjects such as Science, Geography and Mathematics. 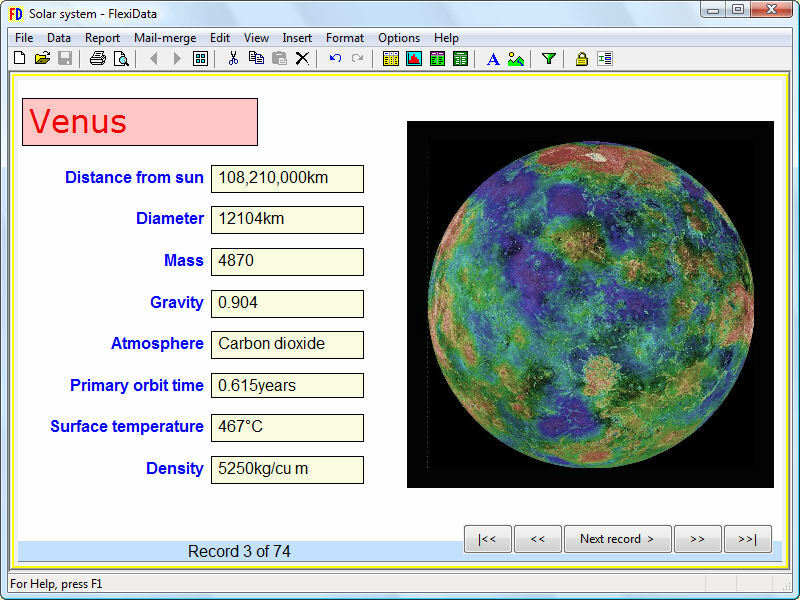 It is very easy to create and edit your own data files with FlexiData. There is a choice of three layouts when editing data - a table with fields across the top and one record on each line, a single record down the screen or the same layout as the questionnaire used to collect the data. Data validation can be switched on or off. You can add, delete, change or re-order the fields; add, delete, sort and filter records; find or replace within a field; undo and redo your edits. 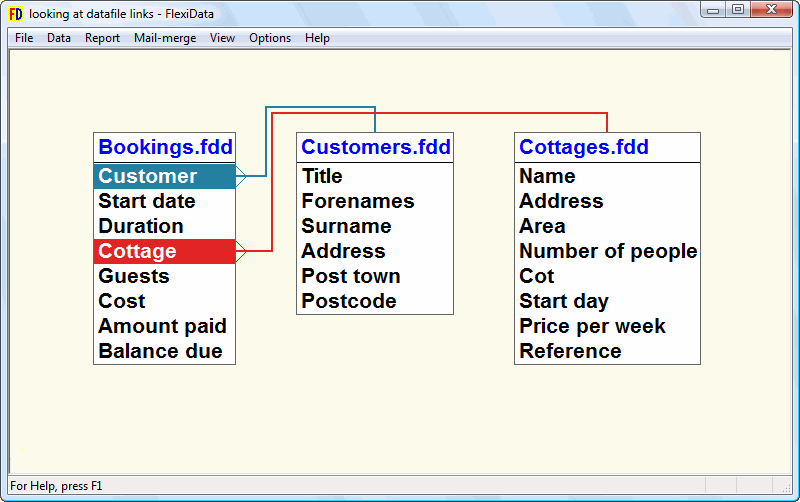 FlexiData enables you to design your own form to collect data. In fact, the program creates a form based on the fields you have defined, and you can then change it as you wish. The program provides the ability to edit questions, insert and edit addtional text, insert pictures, drag items around the page, change fonts, colours, layout and style. This allows you to design a form or questionnaire and to then print the form ready to collect the data. Then, when you come to type the data into the program you can choose to do so on the form you designed to collect the data. You can investigate data by creating information pages. Each page of information can show any mixture of tables, graphs, frequency tables and sets of statistics, up to a maximum of ten items pers page. Each of these items is based on a data file - the program can show information from up to ten different data files at once. Each table, frequency table, graph or set of statistics appears in a separate window which can be overlapped, moved or re-sized. Tables of data and bar charts inside a window can be scrolled if necessary. A page can also contain text which is used to label and explain the information on that page, and pictures to illlustrate it. A collection of information pages is called a report and it can be printed out and saved on disk. Bar charts Choice of 2-d or 3-d.
Label with values or percentages. Choice of order of values. Option to use a second field to sub-divide the bars of the first field. Option to show the second field in percentage form. Powerful option to use the data values in a second field. Option to add a third field of data values. Option to stack bars from different fields one on top of another. Can combine a bar chart and a line graph. Histograms Choice of 2-d or 3-d. Choice of range and group size. Pie charts Choice of 2-d or 3-d. Box and whisker plots Option to use a second field to divide the data. Option to show end lines. Line graphs Choice of range on each axis. Choice of over twenty plotting symbols. Line of best fit with optional equation. Option to show another field on a second y axis. Cumulative frequency diagrams Choice of range on each axis. Scattergrams A two-dimensional frequency table. Choice of order for text values. Choice of count or percentage. Choice of discrete or grouped numeric values. Any graph Double click anywhere on the graph and a 'drill-down table' is inserted showing full details of all the record(s) which match that position. A drill-down table can be formatted like any other table. Option to swap the horizontal and vertical axes. Option to include any units in the axis values or labels. Choice of layout: columns, a list or a record card which can be designed using a simple DTP system. 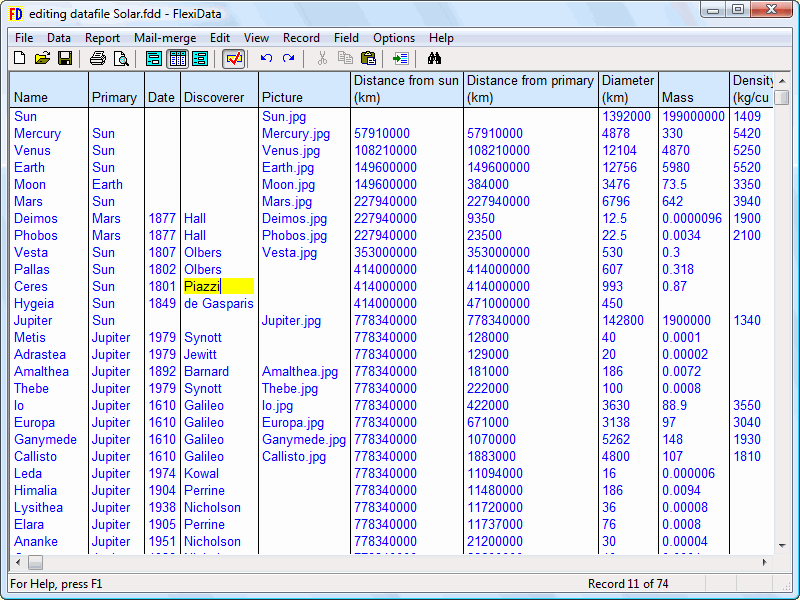 Ability to sort the records on a maximum of three different fields. Apply a style to any field to control how the data is shown. Frequency tables Choice of order for text values. Statistics Mean, median, mode, modal group. 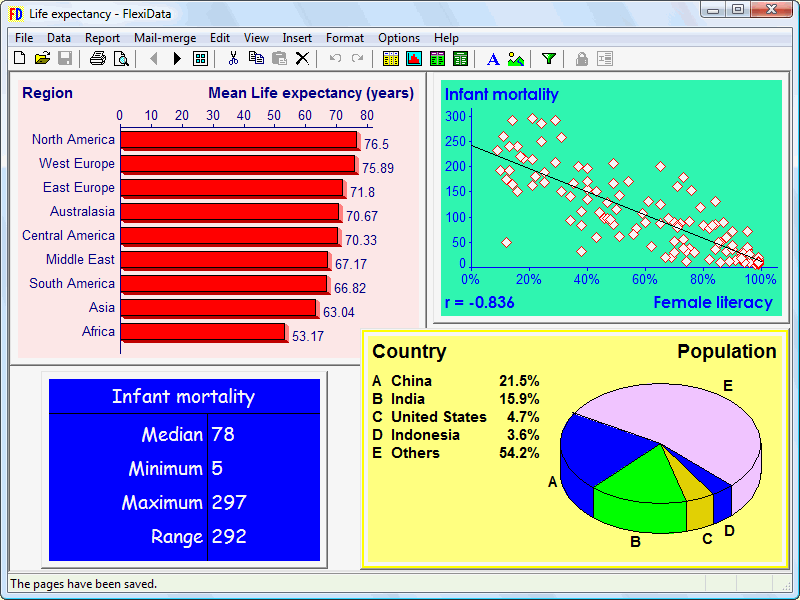 All tables, frequency tables, graphs and statistics Choice of which datafile to use. Select which records are included using a simple Query system, in natural language, which builds up step by step. Select the font and font size. One of FlexiData's most powerful features is the way in which you can use charts and graphs to present information in different ways. 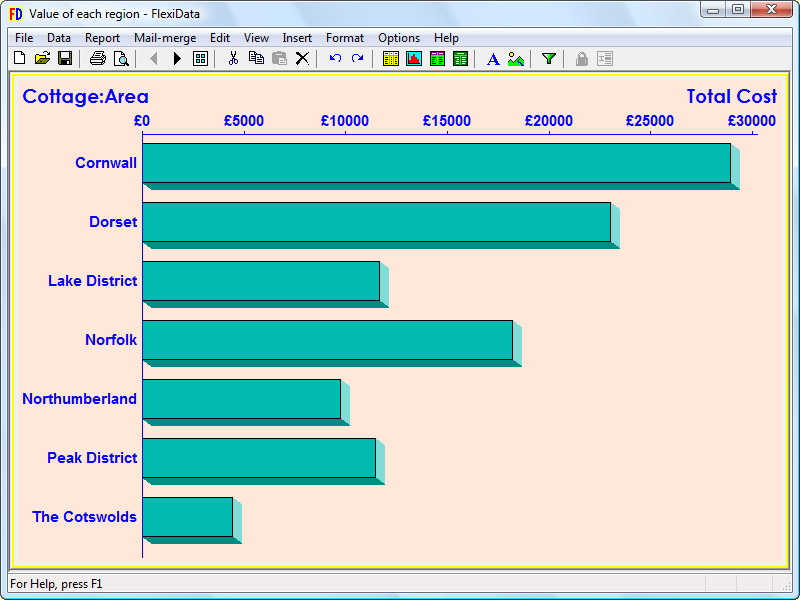 For example, FlexiData offers five different types of bar chart. In the following examples, a class survey has collected the name, hair colour, age and height of each pupil. In a simple bar chart, the length of each bar depends on the frequency - sometimes called a count graph. For example, a simple bar chart of hair colour would show a bar for each colour of hair, and the length of each bar would represent how many pupils had hair of that colour. In a simple bar chart with two fields, the length of each bar depends on the frequency of the first field, but each bar is now divided according to the second field. For example, a bar chart of hair colour and height would show a bar for each colour of hair, divided up according to the height of each pupil with that colour hair. The heights can be put into groups. In a bar chart of data values, the length of each bar depends on a second field. For example, a bar chart of data values using name and height would show a bar for each pupil and the length of each bar would represent the height of that pupil. A bar chart of data values where the first field contains duplicates. For example, a bar chart of data values using hair colour and height would show a bar for each colour of hair and the length of the bar would represent the average height of all the pupils who have hair of that colour. FlexiDATA also offers the choice of using the maximum, minimum or total of the values in the second field. A bar chart of data values using a third field. For example, a bar chart of data values using name, age and height would show two bars for each pupil - the length of one bar would represent the age and the other bar the height of the pupil. 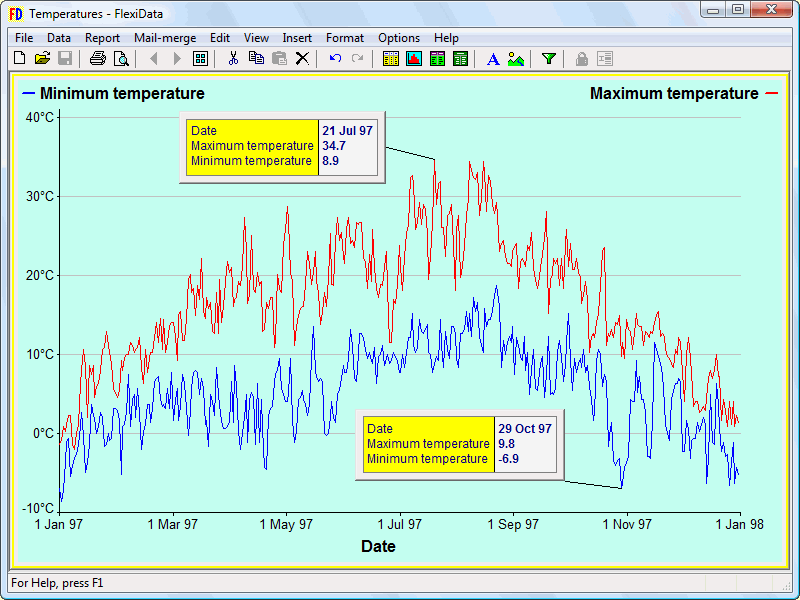 Whenever a graph is shown in FlexiData 4, you can investigate the data behind that graph by using a "drill-down" table. For example, if you are looking at a scattergraph and want to investigate an isolated point on the graph, just double-click on that point and a table appears, showing the record(s) that produced that point. The same technique applies to all the other types of graph, including bar charts, pie charts, etc. Once that table has been inserted, you can format it just like any other table, including choosing the fields that are shown. You can add several drill-down tables to a graph, and future tables will copy the format you chose for the first one. In some situations, the structure of your data may be too complex to fit comfortably into a single datafile. One solution is to split different types of data into different datafiles, and to link from one file to another as required. Another advantage of this approach is that it avoids the same data appearing more than once, which is both time consuming to create and more prone to errors. FlexiData enables you to create, edit and use linked datafiles. 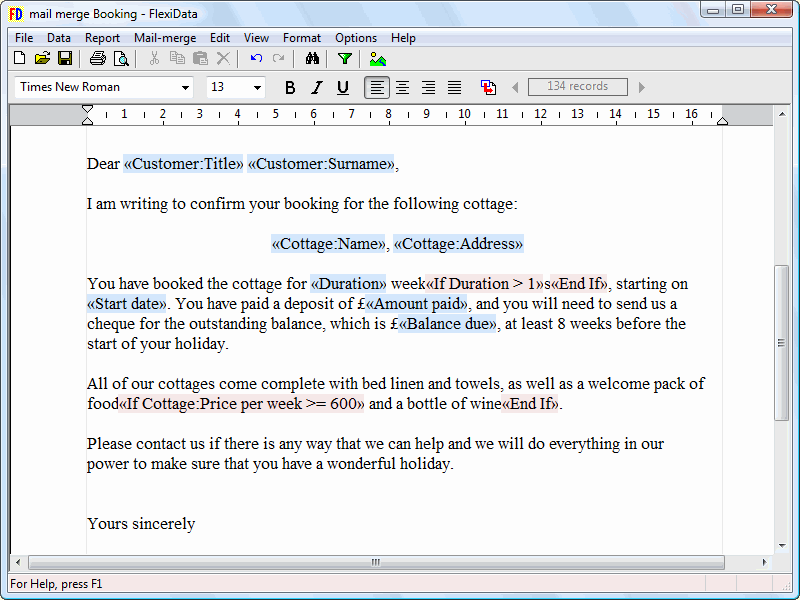 For example, in the following diagram, FlexiData has been used to create a datafile of holiday cottage bookings; that datafile is linked to a file of cottages and to a file of customers. The Customer field of the Bookings datafile just contains a number, called the primary key which connects each booking to a particular customer. Similarly, the Cottage field just contains a number which connects each booking to a particular cottage. You can treat linked datafiles just like ordinary datafiles. You can use the fields in the linked datafiles in graphs, tables, etc, in queries and to sort tables. For example, if you wanted to know which region was producing the most income, choose to insert a bar chart of data values. Choose the field to be the Area in which the cottage is situated. Choose the data values field to be the Cost of each booking. By default, this shows the average value of bookings in each region, so choose to change the data values to be the total. FlexiData includes a complete mail merge system. There is a full word processing program which allows you to create, edit and format documents. It also possible to include fields from the datafile, and sections of text can be controlled by conditions which are similar to a query. The document can also include pictures and picture fields. You can scroll through each of the merged documents on screen or choose to print them out. The same system can also be used for labels including standard pre-cut sheets of labels. FlexiData can import QUEST, GRASS, SID and CSV files from programs like EXCEL and SIMS. You can save your own data on disk at any time using FlexiData's own format or as a CSV file. FlexiData can save and load the information pages. FlexiData includes a system which allows individual pupils to type their records separately and to then combine these records into a single datafile. The process begins with the teacher (and probably the whole class) defining the fields. The program can print out a blank data-capture form based on these fields. After collecting some data, each pupil then uses FlexiData to create their own 'mini' datafile based on the teacher's original file. Finally FlexiData finds all these mini files and merges them into a single datafile. FlexiData has a comprehensive help system which includes over 600 pages of information. The package comes complete with a 68 page A5 manual which contains a tutorial, details of how to use the program and a comprehensive index. We also provide a free telephone support service to registered owners of the software. FlexiData 4 will run on any computer running Windows 10, 8.1, 8, 7, Vista or XP. The program requires the minimum RAM for each version of Windows, 8Mb of available hard disk space and VGA 640x480 graphics (or better). The program will run on stand-alone and networked computers. It may be installed either on individual machines, or on a network server (minimum requirement is a 10 machine licence). It will run on most major network systems including Microsoft, Novell, thin client and RM Connect. The package includes an MSI which is suitable for RM Community Connect networks. able to import files from Excel, Grass, Quest etc.